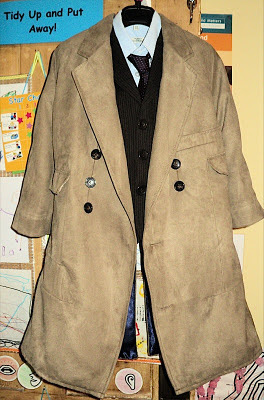 Following my 11th Doctor jacket and a visit to The Doctor Who Experience and actually seeing the costumes in the flesh, I got rather obsessed with the idea of making a ‘Tennant coat’. I had already gathered the suit, shirt and tie from browsing eBay and various charity shops for the closest tie I could to any of the many 10th Doctor ties (please see the amazing section on 10th Doctor ties!) 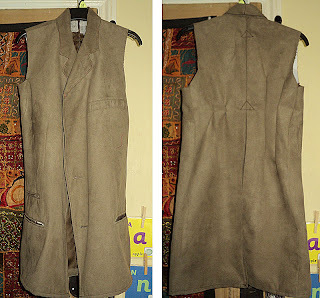 and down-sizing it to fit a 3 year old. I searched and got samples of various suedette, faux suede and moleskin fabrics, and many were close but none quite the right colour. 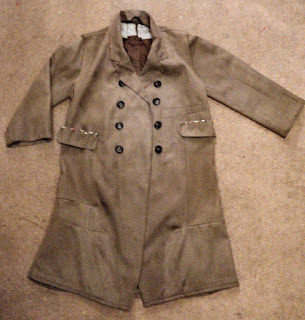 I then randomly found a men’s jacket in a charity shop which was close but still slightly pale, but it would have to do. I started off much the same as the 11th Doctor jacket unpicking and cutting down to my sons measurements, sticking to the shape of each piece as closely as I could, removing and saving any padding to cut down and re-use. I also reused the collar and pressed it to the correct length This time I wanted to make sure it hung well and wanted the darts and vent in the back, as the detail is so important and also so when my son ran it flared out behind just like the real Doctor. 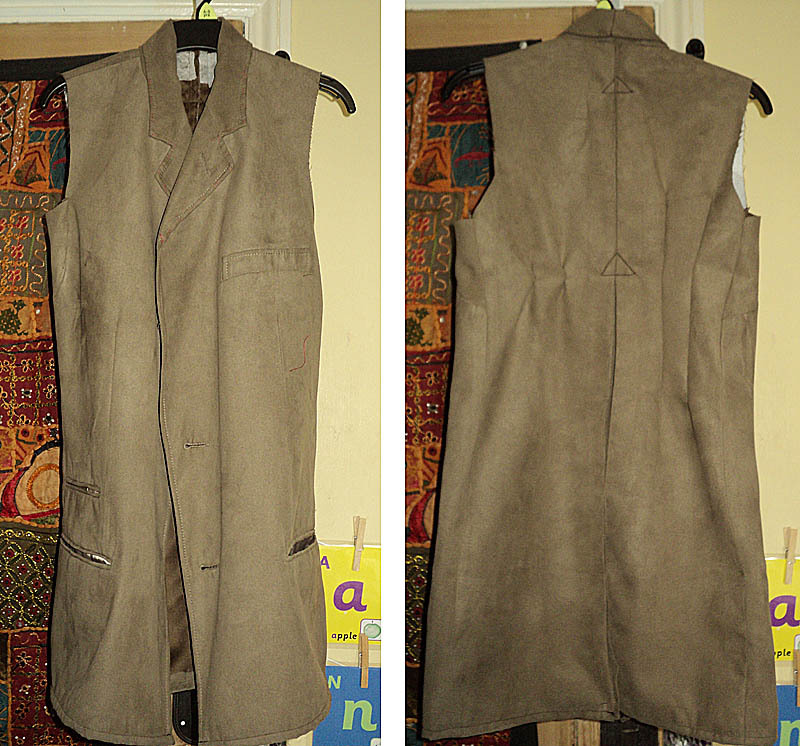 With no experience to help me out, I fiddled for hours until it looked just right, padding re-attached and sleeves sewn in, it really started to look like a mini Tennant coat! I then colour washed it with dark brown dye to take the pale colour down a shade. Measuring the completed coat , I made a reverse coat out of the midnight satin lining, once stitched in place, checked for any twisting then hand sewed it in with fingers crossed that it would look as good as I hoped. Pocket flaps added, buttons stitched on (which I sourced from a haberdashery) I sewed strips of orange ribbon in, to represent the tangerine satin inner pockets and it was complete! As you can see my son delighted in trying it out with the all important ‘running’ of the Doctor. 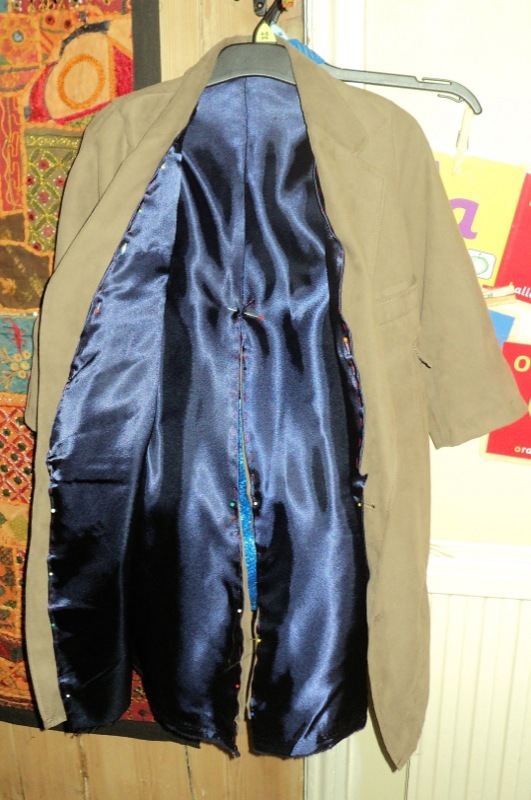 I thoroughly enjoyed the challenge the only part I was slightly annoyed about was the removal of original pockets that spoilt the fall of the coat when hung, but once on and off and running it looks great. 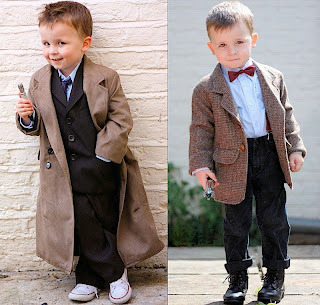 Jamie will love being on the internet :) he is an actor in the making and totally gets into the character of which ever Doctor he is dressed as at the time! 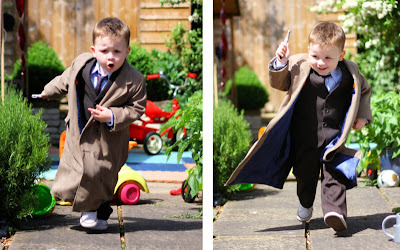 :D my beautiful little Doctor! You've made my day, month, year!!!! They are amazing and he is gorgeous! You are a clever bunch of people! This is absolutely brilliant! He makes a perfect 10th Doctor. I love the picture of him with the serious expression as he runs. Wonderful! This might be the most adorable thing I have seen in my entire freakin life. Fantastic!